Do you think material design style has already reached the peak of its popularity? If you are here, reading this blog post, you might be a trend fan or just a professional who wants to be in the loop of the latest web design standards and best practices. 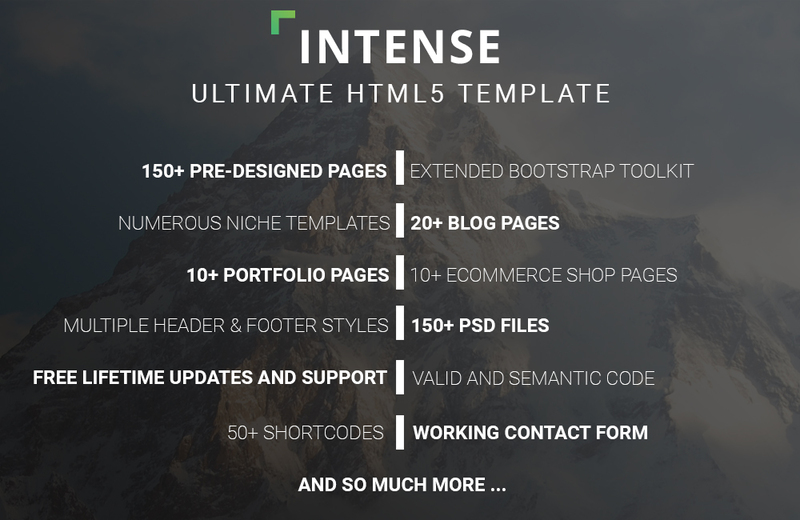 A new multipurpose HTML theme ‘Intense’ was developed by TemplateMonster’s team. ‘Intense’ has a modern material layout. It seems as if designers have taken the most out of the style and spiced the theme up with their personal ingredients to make it different. Click here and submerge into theme’s environments that seem almost real thanks to familiar tactile attributes, light, surfaces, movement and the way how the objects interact with the user and one another. The theme is really pleasant for the eye with its HD imagery, outstanding typography and colors. Elements arrangement creates superb hierarchy, meaning and focus. In a word, having visited this miraculous virtual world once, you will fall in love with it, which would make you come back every now and again. Of course, beautiful layout is not everything you expect from the theme you purchase, so let’s talk about some of the key features of ‘Intense’. 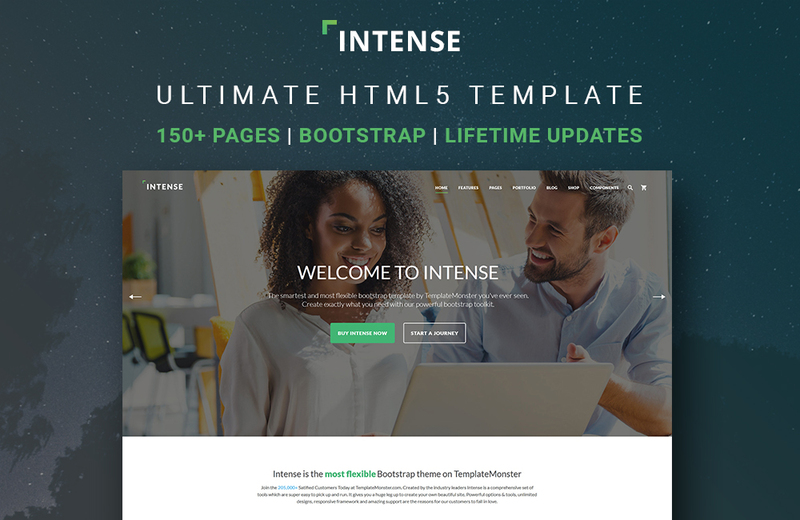 First of all, we would like to draw your attention that ‘Intense’ is not just another HTML 5 website template. It’s a professional solution for personal, corporate, portfolio sites, landing pages, web shops, and many other projects. Intense comes with an all-embracing set of pages and features. It can become a universal tool providing all elements you need for work at the moment. What’s really important is that ‘Intense’ offers free lifetime updates and support. Such kind of big product requires constant tweaks & improvements. After the initial release, TemplateMonster’s team started the series of theme’s updates. You can read about the first one here. The rest of the updates will also take the form of new features, pages, skins, child themes, etc. The owners of the template will be able to track all web innovations and expand their websites opportunities dramatically and totally free. – Absolutely huge choice of pre-designed pages: About Us, Services, Careers, FAQs, Contact Us, Coming Soon, Login, Pricing, Maintenance, Clients, and others are waiting to accommodate your content. – Multiple niche templates. Three templates are available at the moment. Click the following links to view their demos: Intense Restaurant, Intense Photographer Portfolio, and Intense Blog. Child themes will be developed constantly to meet the needs of all business niches. ‘Intense’ pages will also be added regularly. The service is included in the lifetime updates of the template. 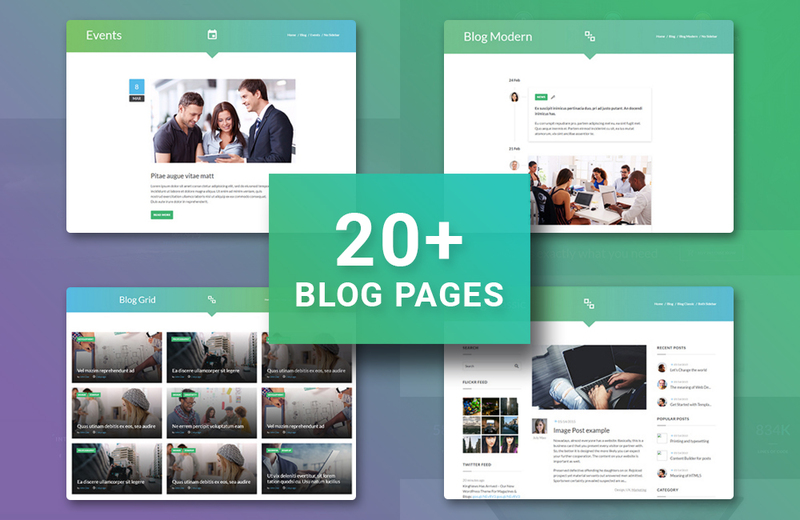 – 20+ Blog Templates. Running a blog helps to engage the customers and enhance SEO of your site, that’s why ‘Intense’ offers a lot of blogging solutions. You can change the layout of your bog from classic and modern to timeline and events. Besides, you can add a sidebar to the left, right and both sides of the page or just go without any. Each blog style possesses its own design for a single post page. – 15 Portfolio Pages. Choose from grid, masonry, wide and full-width layouts to feature your works the way you like. The visitors can filter your projects by categories that can be shown in vertical and horizontal lists, which speeds up their search. You can organize your projects in a different number of columns as well. 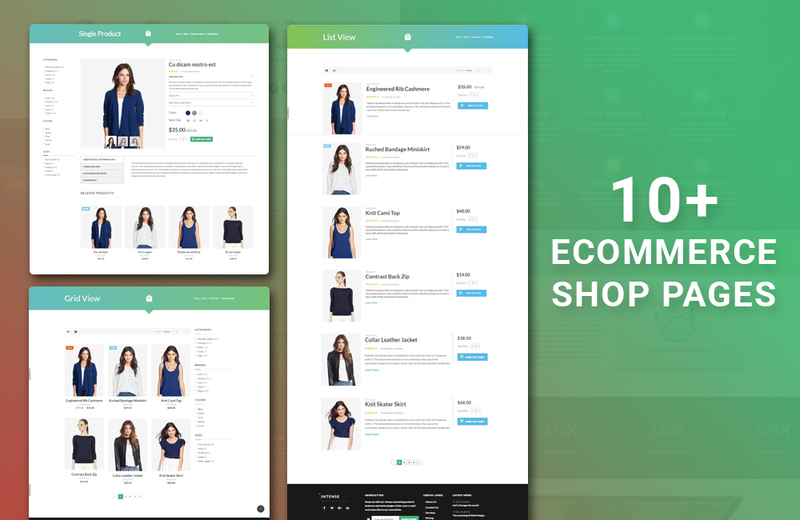 – 10+ eCommerce Templates. ‘Intense’ HTML5 CSS3 multipurpose theme is a brilliant choice for online merchants either. It provides a ready-made single product page and templates to show a variety of items in grid and list view modes. Just like with blogging layouts, you can optionally add a left or right sidebar to any eCommerce layout. Pre-designed pages for cart view and checkout purposes are available. 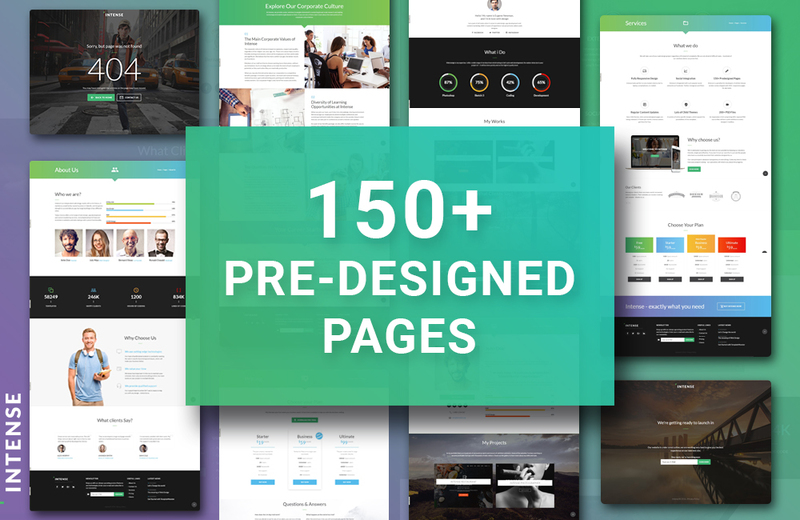 – 20+ Header Layouts. You can use a sidebar toggle, floated, and top panel apart from the default header. Any selected option can be of the light or dark tone. The default variant can be transparent. – 10+ Footer Layouts. The default footer includes a logo, social links, newsletter form, latest news, and links to the main pages of your site. But you can choose another one, say, showing your address, testimonials in a carousel, social links, and contact form. – 150+ HTML Files and 150+ PSD Files come in template’s package, which means that you will be able to modify your website according to your needs. – 50+ Shortcodes and 110+ components are here to make the template’s customization quick & easy. They are great for stuffing the pages with content and functionality for any website type. – Flexible RD Audio and RD Video Players allow to tell the users much more about your company, its products & services in the accessible memorable manner. – ‘Intense’ has a fully-fledged system for integration with social networks, which is a must for modern websites. From Flickr and Instagram galleries to Facebook and Twitter feeds, the template has all popular social widgets. ‘Intense’ adds social options seamlessly to match the overall website harmony. – Extended Bootstrap Toolkit. These are Bootstrap components and an advanced all-inclusive UI kit. This kit contains elements for practically any purpose your project might have. Alerts, breadcrumbs, counters, dividers, infographics, labels and so on. That’s it. The most important features of new multipurpose theme designed in material style have been covered. If the info has sparked your interest, click here to Read more about the template, and here to View its Demo. You’ll see that you can build absolutely any website with this all-purpose solution/toolkit called ‘Intense’. Everything you need for customization comes in template’s package. Nick Campbell, the author of this article, is fond of writing posts on various subjects, particularly web design, e-commerce, social media, marketing, business, and education. He has been involved in the content creation sphere for more than two years. Nick is primarily focused on covering modern trends in a specific industry to help his readers keep abreast of the latest news. If you don’t want to miss any brand new developments in the aforementioned topics, follow Nick Campbell on Google+! NextWant to Learn Material Design? Check Out These 10 Best Resources!